Businesses are constantly striving to become bigger, better and ahead of the competition. You could be part of one the largest businesses in the world but keeping customers happy can be a challenge. Poor customer service can be devastating for a business. Providing timely responses and keeping your clients informed are just some of the things that can really make a difference. It doesn’t matter how good a person is at their job, if they provide a service to customers this should always be exceptional. As part of the Sage 200 support team at itas, myself and the team have a large responsibility regarding customer service. In this blog I will share with you, some of our hints and tips we use on the Sage 200 Support desk here at itas. Our customers contact us on a daily basis via phone or email with queries they are having within the Sage 200 system. During busy periods we set up automatic response emails. It lets the customer know we have seen their email and will take a look into the query as soon as we are available. We always provide a case reference number on any correspondence so the customer can reference this if they need to call. The benefit of doing this is it may be a short while before a member of the support team is available and it reassures the customer that we have seen their query. If customers have to start calling/emailing to chase their query, it has a negative impact on the relationship with the customer. If the customer knows we have receipt of their email, they will be more willing to wait a little longer for a response. Otherwise, how are they to know we have even received anything from them? Once a case has been logged any correspondence back and to the customer is logged within our CRM system, this way if the person dealing with the case isn’t available all of the support team can be kept up to date by reading through the summary report. 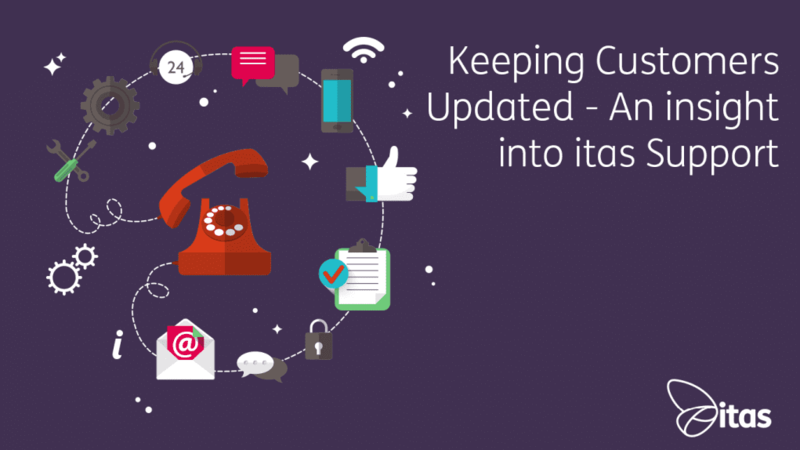 If a case has been passed onto a developer or onto a provider, we will keep the customer updated as much as possible. If we have not received any updates, we will still update the customer telling them so. When a customer joins itas, we assign them an account manager (this is a member of the support team). Every month we call the customers that are due for account calls, updating them with any new product information and releases. We also speak to the customers regarding any cases they have logged since we last spoke and if there are any problems they are experiencing that they may not have made us aware of. The benefits of these account calls mean we get the chance for the customers to give us any information they may not have yet had chance to go out of their way to log with us. These account calls also help build loyalty and create a good working relationship with our customers. It’s always nice to speak with our customers who you feel you have a stronger connection with. Newsletters are sent out monthly to all our customers, keeping them updated with any upcoming training opportunities, latest product releases and enhancements for the Sage 200 system. Included on these newsletters are any changes within the law that may affect businesses. Keeping our customers updated this way means they are given the information without finding out from other resources, providing businesses with useful knowledge and advice. The benefits of this is customers create a greater trust and understanding from us, knowing we are up to date with all current legislation. A big part of support is supporting our customers when they run into errors and difficulties when using Sage 200. We also get a lot of support calls from customers who are unsure of features within the system. Here at itas, we have created a load of really useful support guides to send to our customers. Alternatively, these guides can be accessed on our website, just follow the link by clicking here. These guides provide step by step instructions including screenshots that are easy for customers to follow. Providing these guides are a benefit for both itas and our customers. They document our extensive knowledge in a handy step by step format. The benefit for us is that it frees up our support team! The benefit for our customers is that they have easy access to learning materials that they can keep.